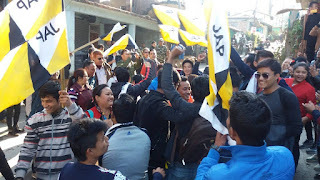 The Jana Andolan Party today released the recording of a purported telephone conversation between one of its victorious Kalimpong College union candidates and Kalimpong MLA Sarita Rai in a bid to establish its charge that the Gorkha Janmukti Morcha was trying to poach its candidates to form the college union. students' body, Jana Andolan Students' Union (Jasu), had won 12 of the 22 seats in the campus polls against Vidyarthi Morcha's 10 on Wednesday. Rai, one of the winning JAP candidates, to support the Vidyarthi Morcha for board formation in return of a good post. "What have you decided about board formation? I was thinking about suggesting you to support the GJM's Vidyarthi Morcha in the board formation. It appears you are in the third year.... While in the third year, if you enter the board in a good post and serve, that would give you very good experience. I had been told to make such an offer to you. What have you got to say about this," she asked. However, when Manisha, in the conversation, wonders why so many offers were being made to her, Rai is heard saying that she was only trying to guide and be of help to a fellow Rai and a girl. It shouldn't be taken otherwise. The JAP president said this was a very unfortunate incident and it only exposed the way the Morcha functioned. "It is unfortunate that she (the MLA) stooped so low. She obviously did this at the behest of her party. This only exposes the way Morcha functions and the way the party has won elections so far. The Morcha claims to have brought democracy in the hills, and this is the kind of democracy they practise. They should learn to accept defeat gracefully," he said. Sarita Rai said she had approached Manisha in good faith after being told that she was an independent candidate and that she had expressed the desire to speak to her.